Jobman Ltd. Is an advisory company, which focuses its services on the area of IT Security and GDPR. Within previous 8 years we have realized advisory services for reputable business entities as primary suppliers, sub-suppliers, partners or in framework of the bodyshopping. We have experience in public sector as well as in business, including the top management. Within the last 18 months, we have focused our services on GDPR. Our team gradually join experts, who have practical experience with key elements relevant to the GDPR. Michal Merta, MBA, MSc., LL.M is a managing partner and a main expert in the field of GDPR, IT Security, IT and commertial law. Michael has a wide range of experience in the aforementioned areas. He was engaged in the management of reputable companies such as Deloite, Commertial Chambre of the Czech Republic, NOVA TV, Prague Heating Corporation, TV NOVA, Energetical Regulation Authority, The Administration of Railways. Furthermore, he was engaged as an advisor, working for the Prague Municipal Authority, PRK Partners, Ltd., Ministry for regional development and the others. He gained experience due to personal engagement on key projects, where he was engaged as an architect, leader or mentor. His key duties were focused on responsibility for technological activities and development of this companies. He also participated on key amendments in strategies and its consequent implementations. Gradually, he obtained priceless know how, which he uses for implementing GDPR and IT security policies. 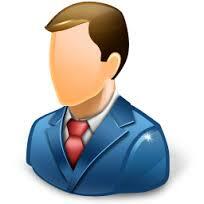 He is responsible for consequent legal issues and implementation appropriate internal rules. Jiří J., MSc. is an expert in the area of telecommunication, data infrastructure, data storages, frontend and backend ICT systems, cybernetics and robotics. He worked for Komercni banka, TV NOVA, Fabric Construction, Prague Municipal Authority and the others. Furthermore, he was engaged as technical advisor, working for technological companies. His main strengths are in the field of diagnose and analyse of robotic and cybernetic systems. His experience is useful, in particular, for an identification of potentially weak points, which may endanger the whole system. Thanks to his knowledge of several programing languages, his engagement in the application level is also possible. Ing. Tomáš S. is an expert in the area of analysis, consultation, process and project management. He has been engaged in the area of development an implementation of IS. He was engaged as a member of the project team in the Czech Golf Federation, Prague Public Transport Company, Prague Municipal Authority, Raifeisen Bankm Eurest, YEVYP, TSK Prague and others. He has analytical abilities, deep experience and pragmatic approach to the identification and consequent solutions of problems. He is one of the best experts in the IT market. The wide portfolio of successful projects (in the business and public area) gives him an ability to find a proper solution for the client. He has an assertive approach. Tomas is a key member of GDPR team. Ing. Pavel Č. is an expert in project management. Throughout his professional life, he moved in the field of ICT in various management positions. He worked on IT projects for TPCA Kolín, TOS Kuřim, Excalibur Army, Ministry of Finance of the Czech Republic, General Health Insurance Company, AutoCont, etc. He gradually acquired knowledge in the fields of Methodology of logical framework in preparation and management of projects, Strategic planning, Methods in the creative solution of problems in Managerial Practice and Project Management, Conflict Management. 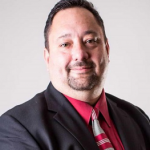 He has gone through a wide range of information systems (ERP, CRM, DMS, ECR, COM, ZIS, PDM, PLM), giving him a global overview of these ISs and their practical implementation and operational problems. 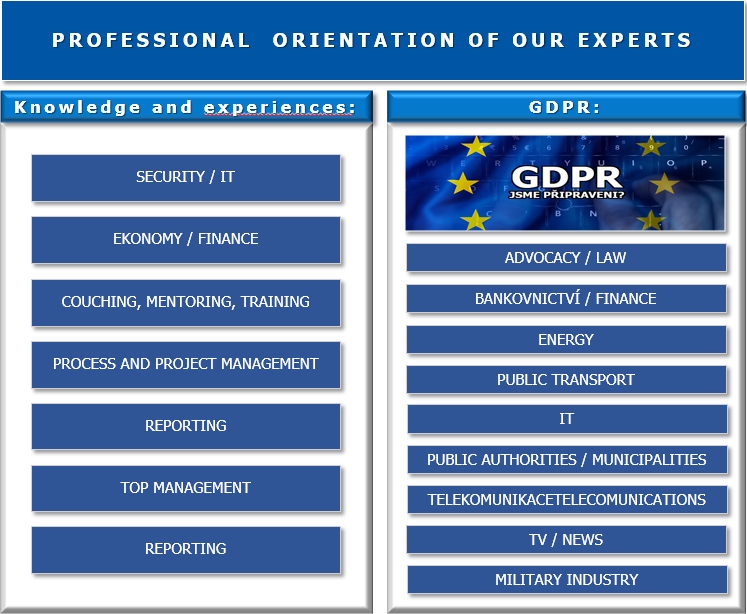 Thanks to this knowledge, GDPR is predestined as a Project Manager and Coordinator with a focus on managing analytical, security and ICT projects. Ing. Jiří Š. is an expert in project management and ICT security. He participated in the design and management of the implementation of complex ICT projects. In recent years, it has focused primarily on ICT security projects. (PMI, PRINCE2, Scrum) and project management tools (Axon.ivy BPM suite, ARIS, Bonita BPM, etc.). ) makes it very effective to manage projects. Combined with the knowledge of ICT security, he is the ideal expert for project management and implementation of ICT audits and implementation of security solutions within GDPR. Systematic and project approach is the ideal partner for active help in carrying out preparatory and analytical work, recording of the acquired facts and identification of security and operational deficiencies. Blog and news use Google translator.